Embracing the multi-screen universe, Microsoft’s Windows 8 blurs the line between desktop computing and mobile user experiences. LG Electronics developed a monitor designed specifically with this operating system in mind, allowing the OS to shine and complementing its mobile look with an intuitive plug-and-play monitor that supports not only multi-touch, but high-quality color reproduction and refresh rates. LG’s Touch 10 lies somewhere between a traditional desktop monitor and a smartphone, bringing the best parts of the mobile experience onto a large screen. The LG ET83 Touch 10 monitor’s ten-point touch capability is optimized for Microsoft’s new Windows 8. Complementing the panel or mobile-like experience of the operating system, the multi-touch capability offers a twist on conventional touch screens to give users more control over the OS and a wealth of gesture options. Typing is more natural, with the added benefit of feeling like Tom Cruise in Minority Report as you swipe through documents and programs on a PC. Taking its cue from mobile environments that have changed the way users interact with applications, the LG ET83 changes the way you interact with your PC. Offering numerous new possibilities, the multi-touch capability allows for applications emulating everything from virtual pianos and stringed instruments to keyboards. The intuitive screen bridges the gap between phones and PCs, allowing swipe, zoom, gesture and point-and-click control that children and adults alike will find simple and natural. Beyond the multi-touch capability, the LG ET83 includes LG’s proprietary In-Plane Switching (IPS) panels, which helps increase the viewing angle and offer brighter, more saturated colors and clarity. IPS also supports faster response times for a dynamic, vivid environment. 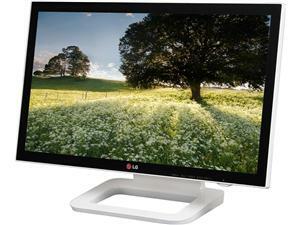 Take a look at this video from Newegg TV for more information about the LG ET83 monitor. About the Guest Author: Michael Paik, Product Marketing Manager at LG Electronics USA. He has been working for past 8 years within Consumer Electronics including LCD TV, Monitor, and Projector categories. I purchased a pool via newegg vminnovations & it was defective. Newegg did NOTHING to help me. I paid 160 dollars & when I go to drain the water after 2 months I find out it’s defective. You would think NEWEGG would help me out. NO SIR. They did absolutely nothing. I will spread this fact all over the internet until they help me out. A credit is in order at the least. A refund would be preferred. However NOTHING is unheard of. NEWEGG: What do you have to say for yourselves?